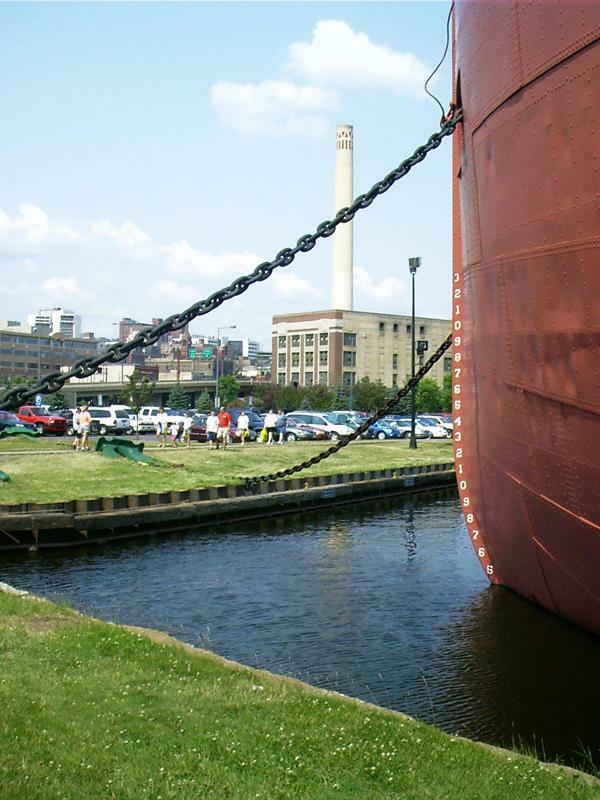 The erstwhile ore boat, The William Irvin is now a floating museum anchored in downtown Duluth, MN. 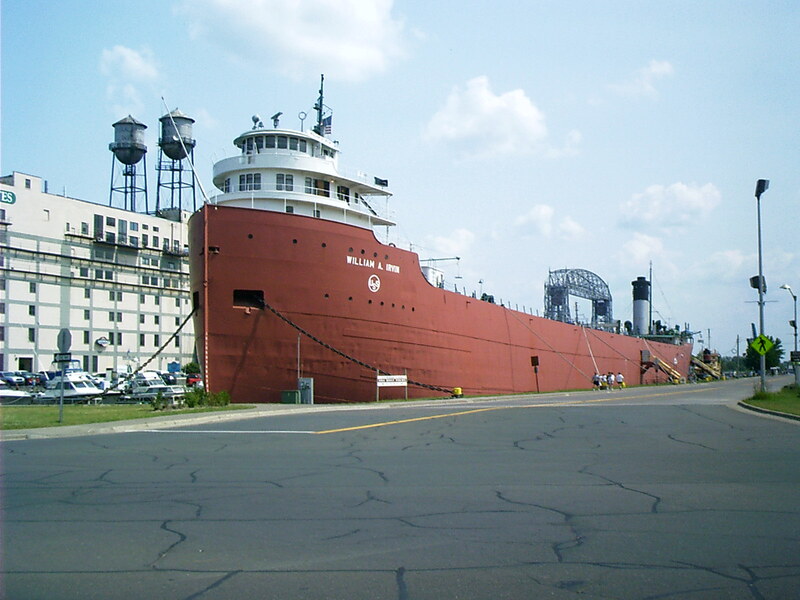 In her day, she carried cargoes of over 13 thousand tons of taconite from Minnesota and Michigan to Ohio and Indiana. In her sumptuously appointed staterooms at the bow, she also carried a bevy of the rich and powerful -- friends, relatives, and business associates of US Steel upper management as well as other dignitaries and elected officials. Eventually, she was eclipsed by longer, deeper, faster ships. Today, there are just over a dozen "thousand footers" plying the waters of Gitche Gumee, carrying cargoes of nearly 70 thousand tons -- and the children and grandchildren of movers and shakers. There are numerous less capacious vessels in the fleet, too, but nearly all now have self-unloaders. This photo index should give you an idea of how many there are: Fleet Photo Gallery: History & Photos of Great Lakes Vessels. Terrorists will be amused to find that they can retrieve near real-time locations of some of the major ships on the Great Lakes. Though not so large as ore boats currently in use, The William A. Irvin is yet an immense artifact. This notion strikes you as you climb the stairs to the hatchway accommodating tourists. The tour, which takes you stem to stern and back, is more than two hours long, including a stroll through a couple of her three enormous holds. The cumulative weight of cargo she transported stretches your imagination to the degree that it dented the steel plates you walk on. During unloading, they used to lower front-end loaders into a hold to scrape up the ore that the shore-mounted augers missed. The SS William A Irvin -- flagship of the US Steel Fleet -- was built in the late 1930's [and launched on June 25, 1938] just as the shipping industry was coming out of a long recession and prior to the WWII shipbuilding frenzy. She was named after the company president at the time. 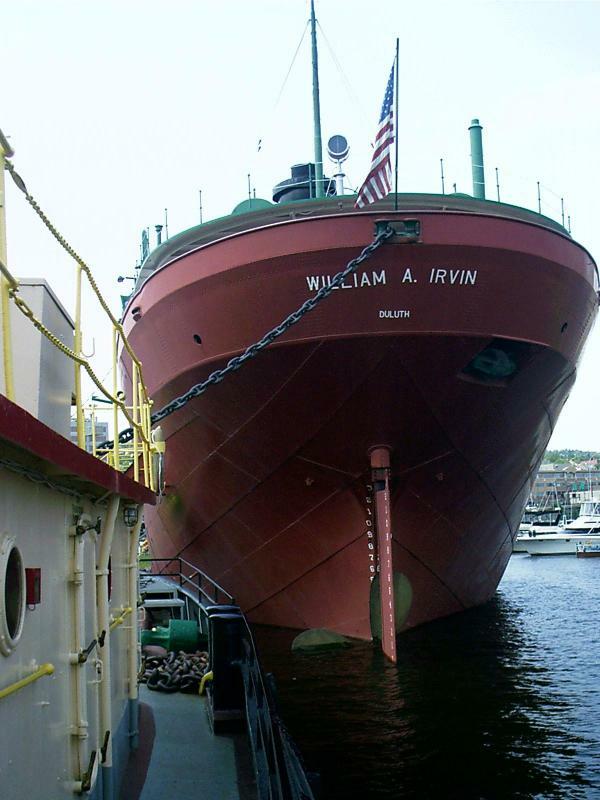 The William A. Irvin sailed without incident* for forty years. On August 27, 1940 she set a record by unloading 13,856 tons of ore in just 2 hours and 55 minutes -- an astonishing accomplishment for a boat using shore equipment only. And that record stands to this day. Her successful forty years of service fulfilled the wishes of her namesake: "She will be a triumph of safety, comfort, and capacity." At the end of 1978 shipping season, the Irvin was retired for economic reasons. Specifically she was a slow boat with small holds and had no self-unloading capability. The Irwin was saved from the scrapping torch only because of her status as a flagship. In 1986 she took on a new role as a tourist attraction for Duluth, Minnesota. Today she is berthed at a former WWII shipbuilding slip where she is visited by thousands every year. She has become the proud figurehead of Duluth's waterfront and offers a glimpse into the world of the merchant mariner. *On April 11, 1964, while up bound on Whitefish Bay, Lake Superior, a boiler burst on board the Pittsburgh Steamship Co.'s William A. Irvin, killing one of the crew and injuring two others. There is an anchor on the opposite bank. Note the draft markings in feet on her prow. At her present mooring, The William Irvin carries no ballast, so her propeller is visible. She has 18 hatches. 16 covers can be lifted by the white crane, which follows tracks on the deck. The other two (not shown) are of a troublesome, motorized, telescoping variety. 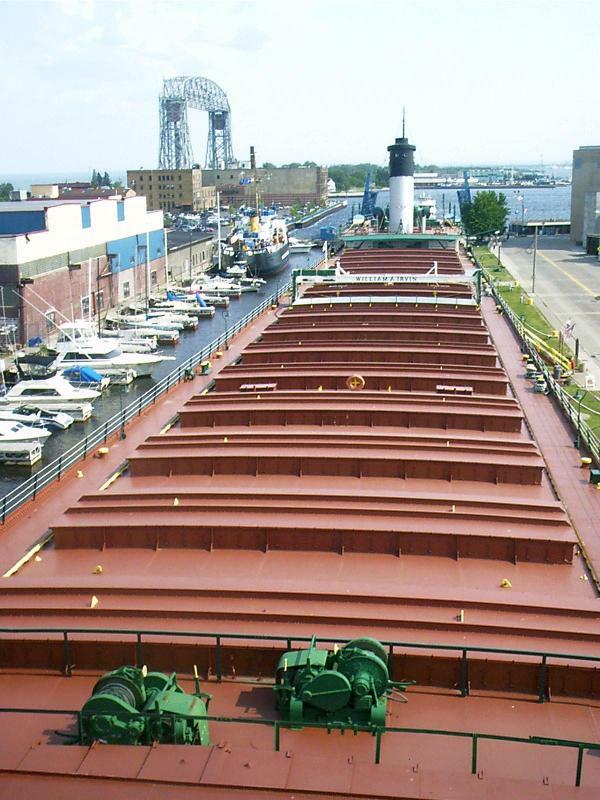 To handle Great Lakes cargo, a special type of vessel has evolved ... the North American "laker," the largest [The Paul R. Tregurtha] being 1,013 feet (335 meters) long, capable of carrying up to 70,000 tons (70,966 tonnes) of iron ore or 1,700,00 bushels (45,552.5 tonnes) of grain in one trip. Rhode, Chuck. "SS William A. Irvin." The Hi-Line and the Yellowstone Trail: To Glacier Park and Back Again. 1 Sept. 2004. Lacus Veris. 24 Apr. 2019 <http://lacusveris.com/The Hi-Line and the Yellowstone Trail/The Bois Brule/SS William A. Irvin.shtml>. Last modified 6 Oct. 2015. Served 23365 times between 16 May. 2010 and 23 Apr. 2019. Contact mailto:CRhode@LacusVeris.com?subject=LacusVeris.